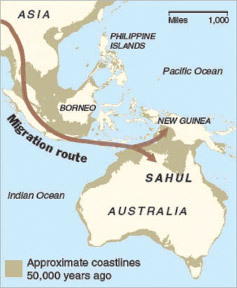 Migration Route to Australia 50,000 years ago. Aboriginal DNA provides human migration clues. Scientists have used DNA evidence from a lock of hair found in WA in the 1920's to map the early migration of humans from Africa to Australia. SOURCE: YouTube (2011), Duration 2:04 mins. In the past, Anthropologists could make an educated guess about when the Aboriginal people first came to Australia from the artefacts they found in Arnhem Land. They predicted it was between 30,000 and 40,000 years ago. Since the discovery of Mungo Man and Mungo Lady in New South Wales, anthropologists now know that the Aboriginal people came to Australia at least 42,000 years ago and possibly as long ago as 60,000 years. That was when large mega-fauna roamed the land and Australia was a very different country. Historians explain some common early views that the Europeans and the Aboriginal people had of one another. Some Aboriginal people thought that the Europeans were ghosts, and some Europeans thought that the Aboriginal people were savages. Despite early mutual curiosity, conflicting views about land use and laws eventually led to Aboriginal dispossession of land, and the assimilation policies of Federation. What do we know about Aboriginal Australians prior to European contact? Historians have used evidence and artefacts to develop a number of theories about when and how Aboriginals migrated to Australia. In contrast, Aboriginal groups have a shared belief system of the Dreamtime, which explains their origins. This clip explores these different perspectives.